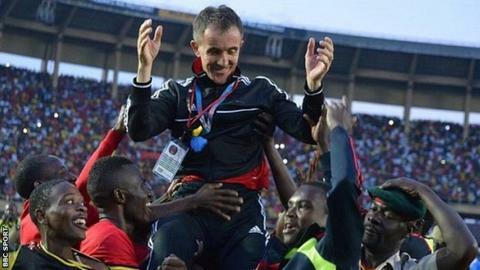 Uganda coach Milutin 'Micho' Sredojevic says Africa has bowed to 'pressure from Europe' following radical changes to the Africa Cup of Nations. The Confederation of African Football confirmed last week that the tournament will be held in June and July instead of January and February. and will be expanded to 24 teams from 16. Sredojevic - whose own future is currently the subject of speculation - was speaking a day after Uganda beat Sudan 5-1 in a 2018 African Nations Championship (CHAN) qualifier. "Though not directly, Africa succumbed to the pressure of Europe to have this tournament played when it's best for them," Sredojevic told BBC Sport. "I have never believed some of these theories that come from Europe on having the Afcon in January and February," added the Serbia-born coach. Caf say the approved changes to the Nations Cup will take effect from the next edition of the tournament in Cameroon in 2019. Sredojevic helped Uganda reach the 2017 Africa Cup of Nations in Gabon - the Cranes' first appearance at a finals in 39 years - and says he does not believe the changes will benefit teams or players. "The Congress and the people who made the changes I am sure have looked at the marketing and money side of the tournament more than the quality." Supporters of the changes say that moving the tournament will make African players more attractive in the transfer market as they will not have to leave a club mid-season, but Sredojevic says he does not "buy into some of these theories." He says he hopes standards remain high and that facilities - especially playing fields - are not hampered by factors such as weather. "It has been so tough to qualify for Afcon with 16 teams and indeed only deserving teams could make it," he reasoned. Meanwhile, the Uganda coach has admitted on social media that he has received other offers, as speculation about his future grows. The Ugandan Football Association released a statement, denying reports that Sredojevic had resigned and confirmed that the FA President, Moses Magogo, will meet with him on Monday.